Posts tagged "CCNA Security certification career scopes"
Cisco Certified Network Associate Security (CCNA Security) validates your basic level of skills and knowledge needed to keep Cisco networks secure. 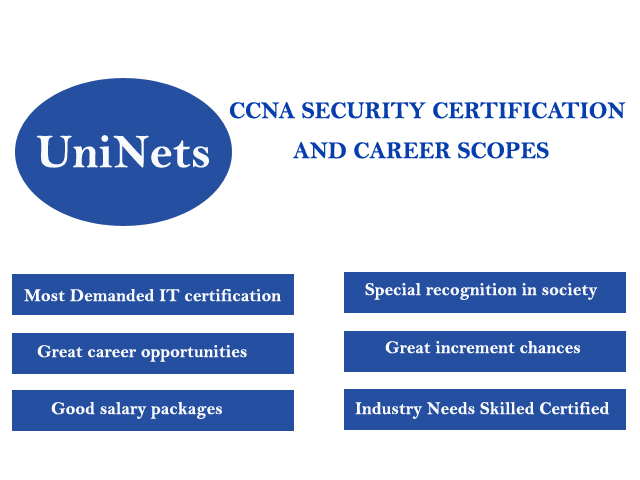 When you have CCNA security certification industry assumes you are able to develop security infrastructures, finding threats, finding network vulnerabilities and you are able to develop strategies to mitigate security threats on networks. The core responsibility of CCNA security certified engineers is to install, troubleshoot and monitor the devices of a network to maintain integrity, security, confidentiality by using technologies. There are some prerequisite for this certification. Below you can see those. You need to pass an exam held by Cisco is must to get CCNA security certified. You should have CCENT, CCNA Routing and Switching (CCNA R&S), CCIE (any certification). Exam 210 – 260 IINS allows learners to understand the basics of security concepts, deployment of techniques to save networks. The main purpose of this exam is to focus on security techniques and technologies by using Cisco security products which can give you hands on experience. In these days every small, medium or big enterprise is concerned about their personal data, network security, data threats and prefers certified professionals. CCNA security certified engineers are in demands in every level of the company. Only you should have sound knowledge of security principles, techniques and technologies used to keep your Cisco networks absolutely safe. From the top level of MNC to small size IT company, Network Security engineers are in demands and if you are Cisco certified then you have more than 70% chance to get hired than other vendors because still Cisco devices are used broadly in organizations in all over the world. In India, you can get a job easily on behalf of CCNA security certification with average salary package of 3,50,000 INR. So, now, we are at the end of this article. If you have any queries about networking courses and career scopes please contact us.